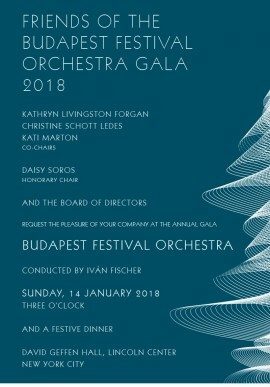 The Friends of the Budapest Festival Orchestra Gala 2018 will be held on Sunday, January 14, 2018 at David Geffen Hall, Lincoln Center (10 Lincoln Center Plaza, New York, NY 10023). Iván Fischer and Budapest Festival Orchestra program will include Bach: Orchestral Suite No. 2 in B minor, BWV 1067; Beethoven: Piano Concerto No. 3 in C minor, Op. 37; Rachmaninoff: Symphony No. 2 in E minor, Op. 27; and Dénes Várjon, Piano Soloist. The performance will begin at 3pm followed by a festive dinner. The Gala 2018 Co-Chairs are Kathryn Livingston Forgan, Christine Schott Ledes, and Kati Marton. The Gala 2018 Honorary Chair is Daisy Soros. Gala 2018 Committee: Susan Bender, Stephen E. and Radka Benko, Nicolette Pathy Bingham, Ambassador and Mrs. Donald Blinken, Ildiko Butler, Aaron Feinstein, Sylvia k. Hemingway, Ambassador and Mrs. Andrew Jacovides, Caron and Geoffrey Johnson, Andrew d. Komaromi and Heidi Lee-Komaromi, Ambassador Ferenc Kumin (PHD Consul General of Hungary), Doctors John and Daisy Merey Mrs. Terez Rowley, Aniko Gaal Schott, Laine Siklos, Stephanie Stokes, Mr. and Mrs. David M. Tobey, and Sylvia Tóth. The Budapest Festival Orchestra performs over 200 concerts each year at the world’s most prestigious music festivals (Lincoln Center’s Mostly Mozart, Salzburger Festspiele, and Edinburgh Festival), and concert halls (among them Carnegie Hall, Concertgebouw Amsterdam, and Musikverein Wien). Their many educational activities include special performances for children with Autism Spectrum Disorder; a series of concerts in disused, abandoned, or neglected synagogues in small towns and villages across Hungary; and the Juilliard Apprentice Program whereby Juilliard students study with Maestro Fischer and members of the Orchestra. The Friends of the Budapest Festival Orchestra‘s mission is to support programs of the Budapest Festival Orchestra. Members have the unique opportunity to build a closer relationship with the Orchestra both in the United States and in Budapest through special events with Maestro Iván Fischer and the Orchestra. The Friends support major programming initiatives of the Orchestra including Dancing on the Square, Community Weeks, U.S. touring, and the Juilliard Apprentice Program, as well as chamber music concerts with important visiting Orchestra members in Manhattan residences. FRIENDS OF THE BUDAPEST FESTIVAL ORCHESTRA IS A 501 (C) (3) TAX EXEMPT FOUNDATION INCORPORATED IN NEW YORK STATE. ALL CONTRIBUTIONS ARE TAX DEDUCTIBLE TO THE FULL EXTENT ALLOWED BY LAW.